"Americans in America" was to be the title of this piece but referring to ourselves as Americans is offensive to some Canadians because it usurps the name of the continent for only one of the countries. Of course, "Americans" is the only single word we have for our nationality and dodging its use means replacing "American" with a sentence like "We are from the US": USA'ian, US-ese, US'ish, or US'er never caught on like such monikers did in countries for which the name isn't an acronym. We grew up in "America" thinking of ourselves and being referred to as "Americans". We had zero sensitivity to others sharing the continent and hadn't a clue as to it being an issue. But when we began traveling extensively overseas 11 years ago, we put our cultural sensitivity on high-alert in general and carefully referred ourselves as "Being from the USA." Amusingly, the politically correct substitute always triggered "Oh, you are Americans." Eventually "When in Rome" prevailed and when speaking with Europeans, we described ourselves as "Americans." When overseas and speaking with English-as-first-language folks we reverted to the longer phrase of "We are from the USA" to be respectful. After 10 years of being overseas more than we were at home, we are again swamped by the US media that equates American with US citizen. Like an ex-pat that understands the perspective from both inside and outside the culture, I am now stuck with my own agility challenges. For the most part, I'll revert to thinking of "American" as an acceptable home-dialect word to use when in informal settings and save my cultural sensitivity for larger audiences. With that digression about who we are behind us, I'll proceed with sharing more about our ongoing process of reacquainting ourselves with the opportunities and challenges of spending more months of the year in our homeland after being relative strangers for a decade. Renting an RV and traveling in the US SW a year ago triggered my formal introduction to Walmart and I instantly became a loyal, though temporary, customer. They won my loyalty for several reasons, with the first being that suddenly, Walmart stores were almost everywhere that we were. That was in stark contrast to my experience at home where I essentially never shopped at Walmart--the lone store in the area because it was too far away. One time we broke-out of our usual shopping orbit and drove miles out of our way to secure a great deal on a ping pong table at the Walmart, but that was it. One third of Americans (US residents) shop at Walmart each week but we weren't among them when at home in the NW. Sometime after completing our 2 months in the SW last year I learned why I hadn't been a Walmart shopper: I wasn't a targeted customer. Walmart historically avoided urban areas and I was an urbanite. Walmart has been shifting its marketing strategy and is creeping in from the fringe of the urban centers but it's still too far out for us. But our US travels that take us from hiking venue to hiking venue frequently have us emerging from the bush and happily landing in the lap of a Walmart store. As backroad travelers, we seek them out and they generally are on our route. We consider ourselves fortunate for having bought our Rand McNally Road Atlas from Walmart because their discounted Walmart edition lists all of the Walmart stores --a resource we regularly use while marveling at their clever marketing. Walmart won me over on our first shopping spree in Las Vegas the day we picked up our rented RV last spring. We love using a basketball for back stretches but the ball was too bulky to fly with, so we left it at home. "No problem": Walmart was selling them for $4. Many of our purchases that day were like the basketball, which meant that they only had to be durable enough for 2 months of use, and then they'd be left behind for others. So rock-bottom priced basketballs, exterior doormats, window cleaner, and the like were perfect for us. I eschewed most of their groceries, knowing I could buy my top picks at Trader Joe's an hour later. But Trader Joe's (TJ's) were few and far between in the SW and I quickly discovered Walmart had high quality, reasonably priced substitutes for the TJs frozen berries and broccoli we ate daily. TJ's prices were better than Walmart's but Walmart's were far cheaper than any of the other regular competition. Knowing this, we refined our shopping routine this year, just like local knowledge shapes our shopping and how much we carry with us when overseas. We hauled 40 pounds of Turkish bulgur from Portland, enough to last our entire visit to the SW, because it is superior to what we can buy on the road. Couscous, multigrain cereal, and chocolate bars are TJ products with excellent quality and price points, so we hauled up to 5 pounds each with us--enough to reach the next TJ's. And the balance on our weekly shopping list was filled-in at competitively priced Walmart. Walmart astounds me. I look at their predominate customer mix filling the aisles and they don't look like us. During our a recent shopping experience in economically depressed Barstow, CA the first couple of dozen customers we saw in the parking lot when we were heading for the door struck me as being young, unemployed high school drop-outs that were busy procreating and doing little else. Not very nice of me, but that is what slipped out of my mouth. And of course, I couldn't help but notice that we were also there. We are slowly learning what and what-not to buy at Walmart. We've been entirely satisfied with the food we've bought there as well as most standard, name-brand products. The can-opener that I thought I'd 'bought-up' enough on barely opens cans and a mattress cover we purchased for the rented RV last spring began shredding as soon as we put it on the bed. 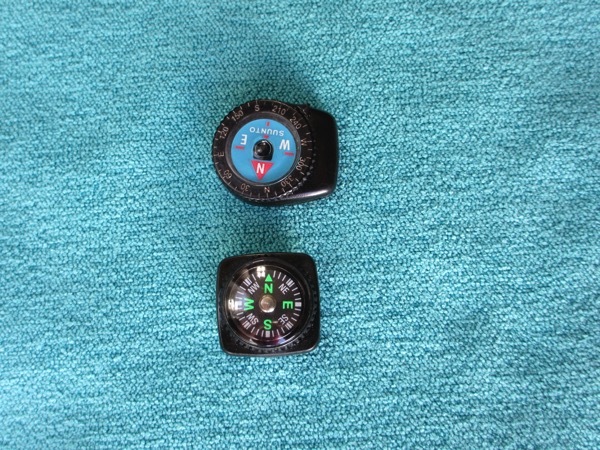 Then I discovered long after I buying a back-up little compass that it was confused about where north was--by about 180º. Normally I would have returned the items but it wasn't worth the trouble when traveling. Instead we've chalked these bad purchases up to experience and are learning when to go elsewhere for products requiring durability. It was in Barstow that we learned something we didn't want to know about Walmart, which is not all of their stores are created equally. Walmart Supercenters are huge with multiple, in-depth product lines, especially in the grocery department. What I thought were the "regular" stores were actually their intermediate-sized "Neighborhood Markets," which were satisfactory for our needs. I hadn't understood until we attempted to buy groceries in Barstow that there was a class of stores in Walmart's brand that had few groceries and those were the "regular" stores--stores where the fresh produce inventory was so small that all of the stock would have fit inside our camper. And a quick scan of the Barstow freezer case revealed that there wouldn't be the usual 5 types broccoli to choose from: it was corn or peas. We were in shock: 10 days without grocery shopping; a long list; it would be several more days until a TJ's was in our sights; and we were shopping at a minimalist Walmart. A quick study of the fine print in the Walmart section of our Road Atlas once back in our truck decoded the situation for me and I finally got it that we were at a bottom of the Walmart heap at Barstow. Bill had almost always routed us to Walmart Supercenters to be safe and we now knew how wise that had been. We'd only be disappointed once: we'd be scrutinizing the table in the Walmart Store Directory in our Atlas more carefully in the future to avoid relying on a regular Walmart for food. Luckily the man restocking the frozen cabinet at Barstow was kind enough to direct me to the other markets in town so we found the food we needed for the next 24 hours though at higher prices than we'd anticipated. 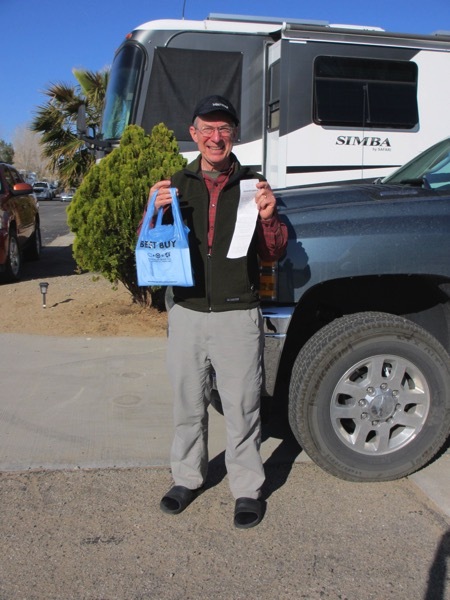 A few days earlier when leaving Death Valley we had been shocked to find ourselves again hooked by Walmart upon discovering their online shopping side. I never imagined that Walmart had an online business and if it did, that I'd ever mail order from them, but sitting through a dust storm in Death Valley changed everything. The hazards of the storm when we'd had no cell phone service for 10 days, no TV reception, and unreliable internet for only 7 of those days had us tumbling to the idea of getting a NOAA Weather Alert radio. That was our best chance for getting storm alerts without making the considerable time, money, and storage commitment of buying satellite equipment and service for our little TV. We could do the research for the alert radio online but actually getting one in our hands quickly would be a challenge. That's when I noticed the Walmart "Site to Store" banner on their webpage. Suddenly Walmart had made it easy for travelers like us to receive mail order items from them on the fly. We are big mail order shoppers, doing most of our buying from Amazon, but delivery addresses are problematic with the online giant. The locked front door of our apartment building eliminates home delivery and many of Amazon's suppliers won't deliver to our PO Box. We've had to rent a private mail box for the sole purpose of receiving packages the 3 months we were at home each year. But clever Walmart has trumped Amazon at its own game: our Walmart order could be picked up at the Walmart store or Fed Ex office of our choice. So when traveling, we can now entirely circumvent the delivery address problem we have with Amazon if we buy from Walmart. Of course, Walmart also must stock what we want. Walmart has thought of everything with their online business. The shipping is always free and they send an email and an SMS when your shipment has arrived, which is perfect for our unpredictable cell and internet access. They have provisions for an alternate person picking up your package and give you1-2 weeks to fetch your parcel once it's received depending on the delivery site. If you can't pick up your item on time, they ship it back automatically at no charge and give you a full refund. Perfect. Finding this "Site to Store" online shopping option with Walmart had Bill squirming for a turn using the computer to see if they carried any of the cameras he was considering. Unfortunately his price point was a notch above theirs but the ease of shopping this way will have us checking items as the need arises, especially when traveling. When at home, I could envision ordering from Walmart and taking delivery at a Fed Ex office in my shopping sphere because their aggressive pricing and free shipping result in considerable savings. And on the road, picking up at a Walmart store will save us on gas because we will be shopping there anyway. 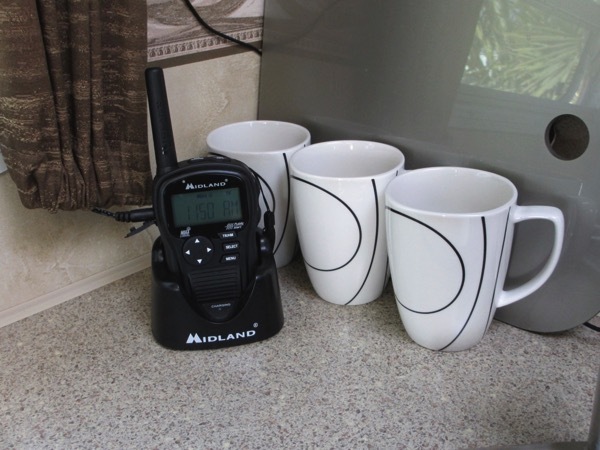 Our truck and camper combo often average 13 mpg, so driving around to other stores in bigger cities to find something like an alert radio is a loser compared to receiving a shipment at a Walmart store we'll be driving by. Of course, we need to allow about a week of lead time but that planning effort pales in comparison to our other shopping challenges when on the road. After years of moving up the considerable learning curves of being overseas travelers shopping on the fly, we felt like we'd learned a powerful new lesson on how to do the same as travelers in our own country with Walmart's unique system. The flimsy receipt could be our ticket to a new camera. Bill made unusually quick work of selecting and buying a camera to replace our Sony that failed in Death Valley during the dust storm (while indoors). The evening of the purchase he casually mentioned that Best Buy had offered him a service contract, but he declined the sales pitch. For 10 of the last 11 years we've been out of the country at least 9 months of the year and so the odds of us collecting on service agreements were so low that we always rejected them without a second thought, except on laptops (which literally had loose parts rattling inside at the end of some traveling seasons). The chances of having a problem when we were at home was even lower with a camera because we often only took a dozen pictures while in the States compared with the thousands we took overseas. And a camera was something we didn't want to be without until we returned home to pursue a warranty issue. But everything was different now that we were in the US 9 months of the year and it was time to rethink our strategy, especially since all of our digital cameras had been replaced because of sudden failures. A 3 year service agreement would buy us a new camera or a repair for the duration at an average cost of $20/yr. Our cameras were usually lasting about 2 years, so it looked like a great deal that could easily cut our cost of digital camera ownership in half. Luckily Best Buy makes allowances for second thoughts and we were able to purchase the Buyer Protection Plan the next day that covers the camera against any malfunction except that caused by full immersion. The larger lesson learned at Best Buy was that our new US-based lifestyle demands that we re-examine many of the assumptions that have guided our decisions for a decade. Clearly we need to relearn how to most effectively live in our homeland at a time when both our needs and the opportunities before us have changed. I pride myself in being a careful shopper but sometimes I can't get it right. In a recent 24 hour period I discovered the replacement I bought for our new, crummy Farberware can opener from Walmart that was worse than the 35 year old one I threw out was missing a handle; that a tiny compass I'd bought months ago for a couple of bucks read "North" when it was pointing "South"; and that my spiffy new NOAA Weather Alert Radio was practically useless. We'll take can opener #3 back in a few days to exchange it; I'm grateful that I discovered the wildly defective compass when it didn't matter; but the NOAA alert radio shopping failure was really, really annoying. I felt duped. I made the selection in a hurry but I read online reviews, scrutinized product specifications, and shopped for it on several reputable sites and nothing alerted me to 2 big problems. Problem #1 was discovered after shredding the plastic packaging shell to locate the buried little instruction manual which, at the back, commented "Mobile home reception is difficult due to the metallic structure preventing reception." Of course, we bought it solely to use in our aluminum camper. Bozo, our new weather alert radio, seemed like such a good idea. Disappointed in the buried disclaimer, we set out to ensure that we somehow kept the device close enough to one of our few windows (and an electrical outlet) so that it would work. I got online hoping to learn when the next test signal would be emitted in our area to assess the reception in our first choice of locations for it. By chance, I detoured to check the weather forecast on weather.com only to discover that there were 2 alerts issued for our area but our device insisted that there were "No Messages". That was Problem #2 and a problem that resulted in our little radio quickly getting dubbed "Bozo". After an hour of researching special codes and trying back-door solutions, Bill discovered that our current location adjacent to Joshua Tree National Park wasn't covered by a NOAA signal at all and worse yet, just about anywhere we would camp would not be in a reception area. We were flabbergasted to discover that at least in the West, the weather alerts were primarily transmitted to urban areas. Favorite places we stay or hope to stay a week or more, often without internet service, systematically were excluded from the storm alert broadcast area. It was unimaginable to us that in this country that has a history of including EVERYONE in its basic infrastructure, harking back to the Pony Express, the US mail, and the first telephone land lines, that there were huge holes in the network. We couldn't believe that in this time of rapidly escalating technology that a national safety program excluded so much of the country. I realized one reason I hadn't even questioned coverage area as an issue when making the purchase was because many of REI's weather alert radios had solar power or hand-crank recharging options. That observation kept any service area concerns from bubbling up because it seemed that this product was adapted for remote-area, mountain-man types. We shared their need-to-know but not their lack of electricity so I was confident we'd be satisfied with the basic product. Bill spent hours researching "Plan B" for getting storm alert information for us. He investigated NOAA's email and SMS systems which were so rudimentary to be useless to us. He briefly subscribed to weather.com's mobile and email alert system only to discover that the first SMS message we received directed us to look online for information. The whole idea was to get the alert information when we had no internet service or cell service but by signing up for both we'd hoped to get notified if we briefly had one of the two services available. On and on he searched for a solution to our isolation problem and threatened to send Bozo back from whence he came. So, it's back to the drawing board, still hoping that the edge we have by being natives in this land will eventually enable us to get what we need, get what we thought we were entitled to for the entry price of a special radio. We are still hoping to no longer feel vulnerable and 'out of the loop' as we so often did as overseas travelers. When we were home from Europe the winter of 2010/11, we learned that to others we were “unchurched, cable cutting, deadbeats" because we didn't attend church, we used an antenna for our new little TV rather than paying for cable services, and we were deadbeats in the eyes of credit card companies because we used their services without paying any fees. Spending even more time in the US among native English speakers created more opportunities than when abroad to collect labels. Early in 2012 I found myself again being entertained and then jolted by the perceptions of others about me. It would have been easy to toss the labels aside, but I reminded myself that being social creatures living in communities means that it can be foolish, if not dangerous, to totally disregard the perceptions of others. In these instances, it was merely a curiosity, an interesting challenge to my self perception to consider them so I indulged in a little game. I’ve known for decades that though I’m short stature that I’m definitely not petite by dressmaker’s standards and always thought of myself as too bulky for “slender.” But in the last 40 years the average weight in the US has skyrocketed while I’ve only added a few pounds. I hadn’t changed much but others had changed a lot and I decided that I could now accept “slender” for myself whereas in the past it didn’t seem quite right. As we walked on, we included “nimble” in one of our new exercises, which is comparing our best guesses of a dictionary definition of a word with each other's definition and with how we would explain the nuances of the word to a person learning English. We later learned that we did well, that “nimble” indeed denoted agility and quickness. The next day when we were out trail running on what was mostly a mule deer path I was reminded that we had very intentionally cultivated being nimble, though we hadn’t applied that word to our training activities. Amused by these chance encounters, I added nimble to my growing string of self-image words issued by others and continued practicing thinking of myself as slender and nimble. No one was waiting when I peeked out of the shower room before toweling off nor when I emerged fully dressed and ready to brush my teeth. While finishing my grooming at the sink, the outside door opened, “Hoarder” was spouted into the room, followed by “Oh!” when I was seen. I never saw the person but quickly decided that they were getting more pleasure from anonymous bullying than displeasure from a delayed shower. When I finally made my exit, I realized that my verbal assaults had likely come from the cleaning man and not an angry female longing for a shower. A small “Cleaning in Progress” sign blocking the doorway suggesting he had been impatient to clean the room though no "Closed for Cleaning" hours were posted anywhere on the grounds. While the barbs from having insults flung at me lingered, it was easy to dismiss the content as nothing to do with me and only to do with his inappropriate channeling of frustration. "Slender" and "nimble" got to remain attached but I did my best to dispatch the unpleasant residue of wrongfully being accused of being a hoarder. Though the game had turned ugly at the end, it had been a mostly amusing run of experimenting with the perceptions of others, a game that I could only play in the US because the nuances of the language required interacting with mother-tongue English speakers to make it interesting. Shifting to being in the US 75% of the year instead of 25% of it as we did for a decade has made it more important to catch-up on what we missed while we were gone than ever before. Being out-of-synch and not-in-the-know with trends and changes in the US mattered less in the past because it was only an issue for a few months of the year, at most. But now it's more compelling to assimilate, to be more in step with our culture. Much of what was anchored in our country's collective memory via TV and entertainment while we were primarily 'away' will forever elude us. But evolving phenomena that became strongly anchored in the language--like bling, bucket list, and MMA (mixed martial arts)--have had us turning to Wiki to catch-up. The subtleties of time and money savers like free Walmart deliveries to Fed Ex offices and the again useful notion of service contracts do matter to us and we are scrambling to fully participate. And being travelers in the US, which we never really were in the past, has added an layer of complexity to upgrading our knowledge base. Perhaps in another year or 2 we'll have corrected most of the important deficits.